It's starting to feel as though Pixar has become a victim of their own success. Turning out some of the greatest family films of the past 18 years, they've reached such a peak that whenever one of their film's doesn't reach the high-water mark of all previous ones, tongues begin to wag about how the mighty production house has finally lost its magic touch. Those allegations began cropping up again before Monsters University was even released. Many bemoaned that it was a prequel and that Pixar was displaying the same lack of creativity that has been attributed to Hollywood in general. To be sure, Monsters University does not pull on the heart strings with the same skill or force that previous Pixar productions such as Up and Wall-E have. It's also not trying to. Instead, it concentrates on, and succeeds at, fulfilling the modest but worthy goal of being an immensely funny and entertaining movie that manages to sneak in some unexpected messages about the disconnect between youthful aspirations and adult realities. 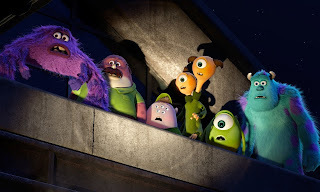 Unlike a lot of other prequels, you don't need to remember a lot of the details of the original Monsters Inc. to enjoy the story, beyond the basic idea that there's an alternate world of monsters who derive energy from the screams of human children. 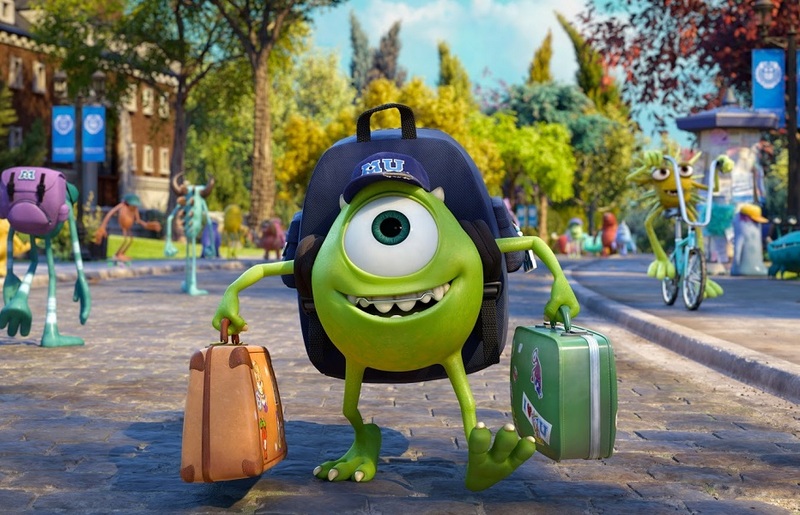 We catch up with the previous film's characters enrolling at Monsters U before they became lifelong friends, as wide-eyed Mike Wazowski (voiced by Billy Crystal) clashes with shaggy jock James P. Sullivan (voiced by John Goodman). Both dream of becoming world-class scarers, the superstars of the monster world who are most skilled at frightening kids, but each approaches the science of scares from different angles. The studious Mike puts in the work while Sully coasts on his family name and natural talent. But when they are ejected from the university's scare program, they reluctantly team up with the least popular fraternity on campus to win the school's annual scare competition and prove they have what it takes. One of the great things about Pixar is that they don't make kids' films; they make family films. Despite the fact that they're animated and filled with colorful characters and zany situations to keep the little ones entertained, there's always a lot of story content and humor directed at the teens and adults in the audience. 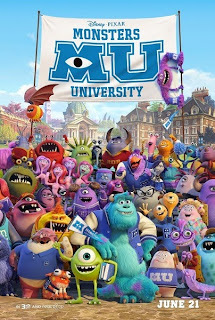 In this case, there's a sharp focus on the details of the college experience as Mike and Sully go through freshmen orientation, dorm life, pledge week, pranks against rival schools, fraternity hazing and even collegiate sports, all of which are slightly skewed for this creature-oriented universe. It's also nice to see Mike, the comic sidekick of the previous film, allowed to grow into being the main character here. We are introduced to him as idealistic, confident, and totally enthusiastic, qualities that are even more endearing and almost heroic when we see they've endured in the face of the social rejection he's been subjected to, a reminder of the unfortunate stigma that smart students often experience at any level of education. Even as the prickly college dean (voiced by a perfectly cast Helen Mirren) assures Mike he's wasting his time in her scare program, he digs in and redoubles his efforts, showing a strength of character you never would have expected from our favorite walking eye-socket before. At the same time, his antagonism with Sully also reveals how that self-confidence can lapse into ego and his determination to succeed begins to border on self-delusion, bringing up a surprising theme that may be slightly SPOILERY to discuss, so consider yourself warned for this paragraph. Throughout the story, Mike rejects the judgment everyone else makes of him: that he's not scary and will never be scary enough to cut it as a scarer. 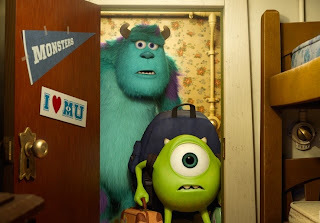 The knowledge of where his character starts from in Monsters Inc. clues us early on that a large part of Mike's education will be learning to accept his limitations. This is a rather daring idea to put across in a family film, where hard work and dedication are usually championed as being enough to conquer any obstacle and achieve any dream. We get a real shock when we're re-introduced to a noticeably svelter Sully, presented as a swaggering, irresponsible jerk rather than the cuddly, sweet monster we rooted for before. He's a great representation of that type we've all encountered in school, the one who has never had to work for anything in his or her life and seems to be able to get by on just a smile, or in Sully's case, a growl. Like every great double-act, both characters compliment each other and come to improve one another. It's also fun to see how their traits inform the adults we have seen them as the original film. Mike's industriousness prepares for him for handling logistics and paperwork and his love of the scaring industry fuels his enthusiasm for setting scare records, a plot point in the previous movie. Meanwhile we see a starting point for Sully's gentleness and compassion for others, traits that will form the basis of his eventual friendship with Boo. 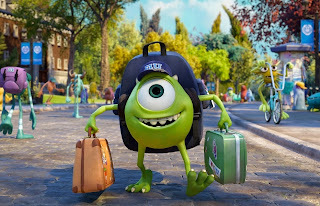 The catalyst for both monsters' personal growth comes in the form of the loveable misfits of the Oozma Kappa fraternity that Mike and Sully are thrown together with. These new characters illustrate various categories of college student. These include Squishy, the awkward freshman who hasn't left the nest yet (Peter Sohn), Dom, the middle-aged career man hoping to better himself (Joel Murray, bringing some of the rumpled desperation of his Mad Men character), and Art, the touchy-feely liberal arts major (an absolutely hilarious Charlie Day). Their presence as the underdogs almost turns the film into a kid-friendly retelling of Revenge of the Nerds and forces Mike and Sully to think beyond themselves, creating the foundation for the team they will eventually become. I remember that when Cars was released, I found myself wondering if that film wasn't as well-received because the dramatic stakes of the plot were so low in comparison to Pixar's other films; it wasn't a matter of good vs. evil or lives at risk as in the previous movies. I thought this decision gave that film a bit of a relaxed tone, perhaps too relaxed. Monsters University is structured similarly but because it's more of a college comedy than an adventure, the easy-going pace of the story suits it better. We don't get a jaw-dropping action scene like the door chase from the original film and we may not feel a huge amount of dramatic tension as our heroes compete against the other fraternities in the monsterized equivalent of 'the big game,' but the good-natured humor throughout and the interesting places the final act takes Mike and Sully ensure we don't feel deprived. To the film's credit, it resists the usual impulse when making prequels: to explain how every little detail of the original came to be. Aside from a few tiny cameos, the only other holdover from the previous film is the pair's chameleon nemesis Randal (Steve Buscemi), cannily depicted here as a nerd with no moral qualms about selling out his friends to get with the cool kids, suggesting the bitterness that will drive him in later life. For the supporting cast of faculty and students, there's an amazing list of actors voicing smaller roles, including Alfred Molina, Nathan Fillion, Aubrey Plaza, Tyler Labine and John Krasinski, again illustrating the Pixar tradition of casting for interesting performers rather than big names. Another factor of Pixar's output that can't be glossed over is their incredible technical perfection. It's no surprise to find they have crafted another beautiful-looking movie full of cheery, vibrant color. The textures of characters and objects are breathtakingly tangible and every film shows leaps and bounds of improvement to their craft. 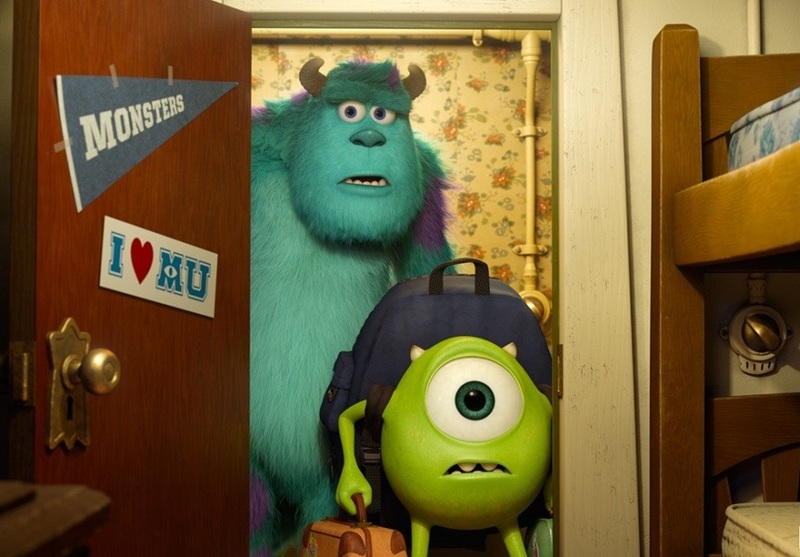 With Monsters Inc., the big development was the software that gave Sully his fluffy coat of fur. Here, you can see amazing innovations in the use of light and shadow. Several scenes of the characters on the campus quad play out in soft light or overcast conditions, displaying amazing gradients of shading. The great design work offers other pleasures as viewers can have fun trying to pick out all the monstrous faces hidden in the architecture and landscape. That's in addition to the usual assortment of Pixar in-jokes and cameos, including the ever-present Pizza Planet truck and a quick appearance by a character from their upcoming movie The Good Dinosaur. With some many of our movie options this summer focusing on property damage, death tolls and efforts to pummel us into awe with their colossal scale, I think there's definite value in a movie that's content to be a spot of comfortable fun and give us the chance to slip back into a world we enjoyed and hang around with old friends we made there. If Monsters University is any indicator of the value of their work, we don't need to worry; Pixar's still doing just fine.